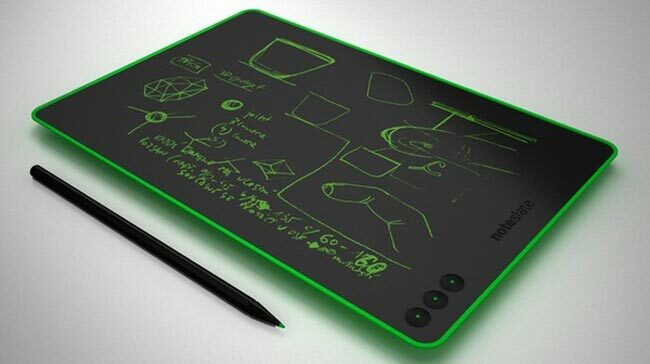 The NoteSlate is a $99 one colour (at a time) low tech electronic ink tablet concept, with a smart design and real paper feel. Its fitted with a battery which is capable of providing up to 180 hours of use from a single charge and weighs in at just 240g. The simple design allows you to take notes quickly and easily and either save them for later or delete on demand and has been deigned for anyone who needs to record ideas on paper and are still doing it with pen. 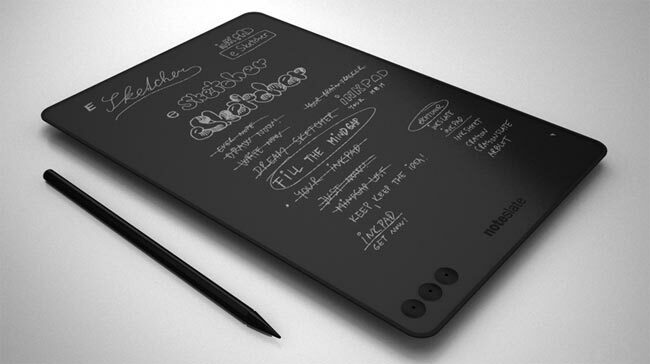 NoteSlate, is roughly A4 in size measuring 210 x 310 x 6mm with smooth edges and a matte screen to provide the feel of paper when in use with the stylus. The eInk monochrome display measures 190 x 270 mm, 13” across the diagonal and has a resolution of 750 x 1080 pixels. Its equipped with 3 physical buttons for a simple user experience, allowing you to, save current screen , view previous screen or delete current screens at the touch of a button. On the top side of the devices there is a USB port, on/off switch, headphones socket and SD Card card slot.